Nominal money and credit flows in the EMU show mostly flat rates of growth over the last three years as well as for the progressive rates within the past year. Credit growth shows some tendency to faster rates of growth but only if you are into hair-splitting. Growth rates show a bit more 'kick' in real terms, but the right hand column on oil prices reminds us that lower oil prices and weakened inflation are responsible for that. Still, lower inflation does cause there to be a pick-up in money and credit growth in real terms in the presence of nominal stability. It's just not clear at all how meaningful that is. Over the past year credit and private credit growth rates still are below 1% in real terms. That is weak. In terms of longer trends, the year-over-year inflation rates in the U.S. and the EMU have showed some modest pick up over the last year, but in the past several months the inflation uptick has either dissipated (EMU) or turned to a year-on-year decline (U.S.). In Japan, inflation turned sharply lower and declined year-over-year in December. U.K. inflation, having previously been boosted by BOE stimulus programs, has been falling steadily since early in the year. The weakening of inflation has caused real money and credit growth to turn slightly higher globally, but not in a meaningful way -- at least not yet. The table shows broad trends in growth and inflation monthly showing only year-on-year changes. For the U.S. inflation rates have steadily come in month-by-month above their year-ago values, but surprisingly in view of that trend, the year-on-year inflation rate has declined almost steadily since July. 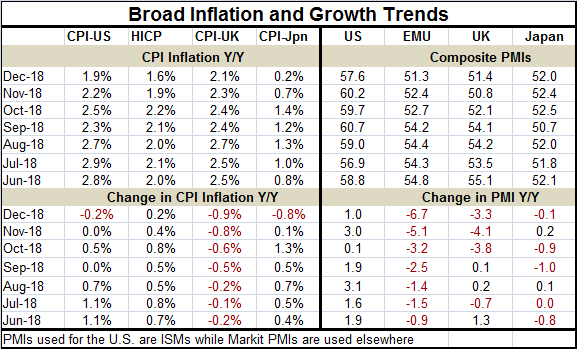 In the EMU, the HICP has also steadily come in above its year-ago value for the same month, but the inflation pace was roughly steady through October and it since has fallen off and fallen somewhat sharply in December. Conversely, the U.K. has showed steady monthly inflation deceleration from year-ago values and from August the pace of inflation also has fallen based on its sequential year-over-year performance. Japan's inflation was higher month-by-month compared to its year-ago pace, but the inflation rate itself peaked in August and fell off more or less steadily since then. The inflation dynamics for each of these countries is unique; yet, in terms of broad trends, they do have a lot in common. In June all but Japan had inflation at or above 2% while in December all but the U.K. have inflation below 2% - and all are on a declining profile, largely thanks to weak and falling oil prices. On the growth side (judging from composite monthly PMI readings), we see year-on-year PMI changes are negative just about everywhere except in the U.S. The U.S. composite PMI has been steadily higher month-by-month since at least June. However, PMI level readings have generally declined as 2018 progressed in the U.K. and the EMU. Japan's readings have fluctuated but have remained broadly stable at levels marginally above 50, showing ongoing modest expansion. In the U.S. for four of the last five months, the composite PMI has clung to readings close to 60. The exception is December when the composite dropped to its second lowest reading in the last seven months. These data serve as a reasonable backdrop to portray growth and inflation against a background of money and credit growth that has been modest. What does it tell us? Only in the U.S., does money growth look anything like 'generous' with M2 at a 6.1% annual rate over three months and averaging over 4.5% per year over the last three years. In the EMU, money and credit growth over the past year are at 4.4% for money and 2.3% for private credit. For the U.K., money growth is at 1.4%. In Japan, it is at 2.4%. Clearly, central banks have not put their economies in a deep pool of liquidity. While judging from interest rates, we would call rates everywhere 'historically low' and regard them as 'stimulative' and we would not draw the same conclusion about monetary ease judging from the growth of real or nominal monetary aggregates and credit except perhaps in the U.S. So... why the divergence?